Not to be confused with Chicken tikka. "Chicken masala" redirects here. For the Italian dish, see Chicken marsala. Chicken tikka masala is a dish of roasted chunks of chicken tikka in a spicy sauce. The sauce is usually creamy, spiced and orange-coloured. It has been claimed to have originated in Glasgow and is among the UK's most popular dishes, leading a government minister, Robin Cook, to claim in 2001 that it was a British national dish. Chicken tikka masala is chicken tikka, chunks of chicken marinated in spices and yogurt, that is then baked in a tandoor oven, and served in a masala (spice mix) sauce. A tomato and coriander sauce is common, but there is no standard recipe for chicken tikka masala; a survey found that of 48 different recipes, the only common ingredient was chicken. The sauce usually includes tomatoes (frequently as purée), cream, coconut cream and various spices. The sauce or chicken pieces (or both) are coloured orange using foodstuffs such as turmeric powder, paprika powder or tomato purée, or food dye. Other tikka masala dishes replace chicken with lamb, fish or paneer. The origin of the dish is disputed. 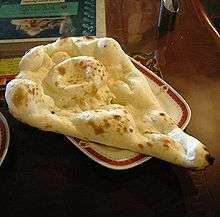 One of the explanations is that it originated in an Indian restaurant in Glasgow, Scotland,  but probably from the British Bangladeshi community which ran most Indian restaurants in the United Kingdom. Rahul Verma, a Delhi expert on street food, offered a different explanation, speculating in 2009 that the dish may have originated—probably by accident with subsequent improvisations—in the Punjab and Uttar Pradesh during the last 50 years. On a typical dark, wet Glasgow night a bus driver coming off shift came in and ordered a chicken curry. He sent it back to the waiter saying it's dry. At the time Dad had an ulcer and was enjoying a plate of tomato soup. So he said why not put some tomato soup into the curry with some spices. They sent it back to the table and the bus driver absolutely loved it. He and his friends came back again and again and we put it on the menu. In July 2009 then British Member of Parliament Mohammad Sarwar tabled an Early Day Motion in the House of Commons asking that Parliament support a campaign for Glasgow to be given European Union protected geographical status for chicken tikka masala. The motion was not chosen for debate, nor did Sarwar speak on this subject in Parliament. The historians of ethnic food Peter and Colleen Grove discuss various origin-claims of chicken tikka masala, concluding that the dish "was most certainly invented in Britain, probably by a Bangladeshi chef". They suggest that "the shape of things to come may have been a recipe for Shahi Chicken Masala in Mrs Balbir Singh’s Indian Cookery published in 1961". In 2001, British Foreign Secretary Robin Cook declared that "Chicken Tikka Masala is now a true British national dish, not only because it is the most popular, but because it is a perfect illustration of the way Britain absorbs and adapts external influences." He went on to explain that "Chicken Tikka is an Indian dish. 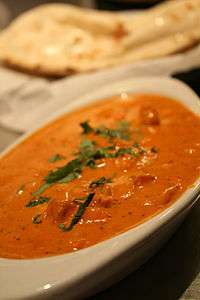 The Masala sauce was added to satisfy the desire of British people to have their meat served in gravy." The claim that Chicken Tikka Masala is a British "national dish" met with both acclamation and sceptical opposition. Chicken tikka masala is served in restaurants around the world, including Indian restaurants in Britain and North America. A 2012 survey of 2,000 people in Britain claimed that it is the country's second most popular foreign dish to cook, after Chinese stir fry. 1 2 Nelson, Dean; Andrabi, Jalees (4 August 2009). "Chicken tikka masala debate grows as Indian chefs reprimand Scottish MPs over culinary origins". The Daily Telegraph. London. Retrieved 28 April 2010. 1 2 "Robin Cook's chicken tikka masala speech: Extracts from a speech by the foreign secretary to the Social Market Foundation in London". Guardian. 19 April 2001. 1 2 Lloyd, J and Mitchinson, J. The Book of General Ignorance. Faber & Faber, 2006. ↑ Jackson, Peter (2010). A Cultural Politics of Curry in "Hybrid Cultures, Nervous States: Britain and Germany in a (post)colonial World". Amsterdam: Rodopi BV. p. 172. ISBN 9789042032286. Retrieved 3 June 2014. ↑ Webb, Andrew (2011). Food Britannia. Random House. p. 177. ISBN 978-1847946232. Retrieved 3 June 2014. 1 2 Gillan, Audrey (21 June 2002). "From Bangladesh to Brick Lane". London: The Guardian. Retrieved 21 July 2002. ↑ "BBC News Online: Glasgow 'invented' Tikka Masala". London. 21 July 2009. Retrieved 31 December 2009. ↑ Agencies (6 August 2009). "Scots lay claim to chicken tikka masala, Indians fume". The Times of India. Retrieved 9 September 2009. ↑ "UK Parliament Early Day Motions 2008-2009". Retrieved 11 August 2010. ↑ "UK Parliament Archives 2008-9". Retrieved 11 August 2010. ↑ "UK Parliament Archives 2009-10". Retrieved 11 August 2010. 1 2 Grove, Peter; Grove, Colleen (2008). "Is It or Isn't It? (The Chicken Tikka Masala Story)". Retrieved 16 November 2015. ↑ Mannur, Anita (2009). Culinary Fictions: Food in South Asian Diasporic Culture. Temple University Press. p. 3. ISBN 978-1-4399-0077-2. ↑ Collingham, E. M. (2006). Curry: A Tale of Cooks and Conquerors. Oxford; NY: Oxford University Press. p. 2. ISBN 0-19-517241-8. ↑ Jo Monroe, Star of India: The Spicy Adventures of Curry (Wiley: 2005 ISBN 9780470091883) pp. 136-137. ↑ "The Hindu: Tastes that travel". Chennai, India. 24 February 2007. Retrieved 1 June 2007. ↑ Aravind Adiga (20 March 2006). "The Spice of Life". Time. Retrieved 1 June 2007. ↑ "Stir-fry now Britain's most popular foreign dish". The Mirror. 21 January 2012. ↑ Hills, Suzannah. "Vindawho? Chicken tikka masala knocked off top spot by Chinese stir-fry as Britain's favourite dish". Mail Online. Associated Newspapers. Retrieved 10 May 2015. Collingham, Elizabeth M (2006). Curry: A Tale of Cooks and Conquerors. Oxford University Press. pp. 2–3. ISBN 0-19-517241-8. Wikimedia Commons has media related to Chicken tikka masala.